I have bought an 60 (assumed) year old 1.6 nobekan with Tozan inlay from the (e)Bay. Cheap. The outside feels a bit adhesive. This comes from some lacquer. It can easily scratched off with the finger nails and is already gone where the right thumb is placed. This spot of plain bamboo looks much better the then lacquered parts. How can i get rid off that lacquer? Scratching with my finger nails? Something better? It smells a bit muffled. It is jinashi. You can see that the nodes are not completely removed inside. Red lacquered. Lacquer gone around the utaguchi inside. There is a binding near the blowing edge. Looks ugly. No visible cracks. Maybe its bound for aesthetic reasons. Can i remove it without damaging the flute? The tuning is not good. It plays (Otsu) E 0%; G -30Cent; A -20Cent; B +10Cent; D -40Cent E 0Cent. Is this flute worth any effort? I'll say my opinion about the tuning and let the maker pros and aficionados answer the rest. For me, if the flute has a timbre I am fascinated by - then these imperfections in tuning is no problem. I find it both rewarding and fascinating to try to adapt to the flute. If I play enough on a new flute I get used to the tuning and correct or control the tuning with the breathing and of course also the head position. 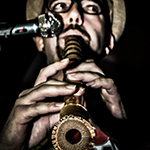 For me the process of adapting one's breathing and playing to a flute is amazing.... but not everybody would think so. Some - I know - think I am absolutely mad! Dr Simura Satosi did a research project where he got some super pro to play each other's flutes. The result was that the owner played very well in tune... and the others played fairly.. ahem... out of tune at their first try or tries. Interesting to know... and he said all the flutes were really good flutes. Anyway, it is up to you to decide whether the flute is worth your efforts. This comes from some lacquer. It can easily scratched off with the finger nails and is already gone where the right thumb is placed. This spot of plain bamboo looks much better the then lacquered parts. How can i get rid off that lacquer? Scratching with my finger nails? Something better? 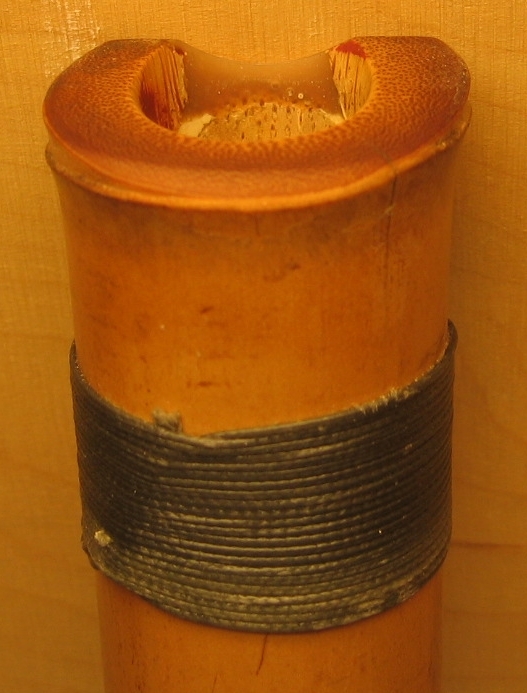 I had a shakuhachi totally laquered on the outside and when some started peeling off I decided to scrape it off the entire flute. First with my fingernails but that only worked for a small portion and I scraped the rest off with a knife. It looks awful. I suggest not scraping it off yourself. That tuning is pretty normal for an old flute. Are you sure it's Tozan? Chi is usually sharp there and tsu is usually flat. Can you post a picture? If it's nobekan and jinashi it's more likely to be Myoan than Tozan. So if you use it for Myoan music or just jamming you should be fine. from my own experince your best optin is to look for somthing hard and shar enough to scrap the laquer but not leave a mark on the bamboo, you should try wooden or plastic knifes maybe or a sharp edge of a bambo scrap. another option that i dont think will do any harm to the bamboo is color remover, benzine, acetone, turpentine. be very careful with those, since they can harm both you and the lacquer you dont want to remove (inside). it should also remove the stickiness. I can't tell if its Tozan or Myoan. I only can say it has an Tozan inlay. It was bought in Japan around the 50tes. Yes Tsu is flat -30Cent and chi is sharp +10Cent. Never played an old flute until now. If the tuning is common for old flutes i will leave it as it is. Will ad pictures asap. Tozan and Myoan utaguchi look similar. Maybe when we see the pic we can tell more easily. 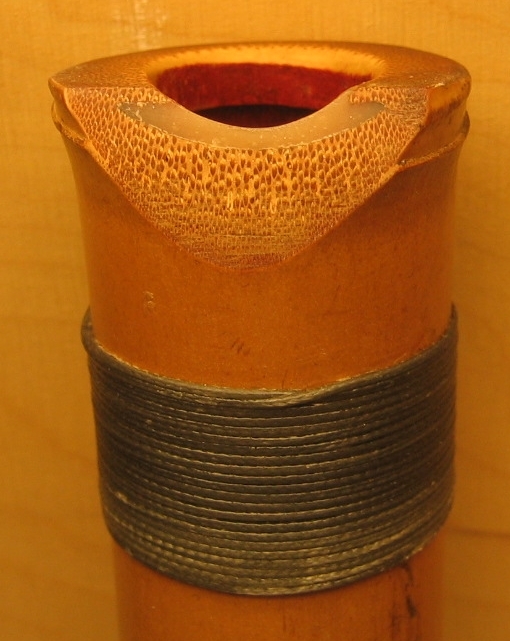 As Brian said the tuning is common for old flutes. But correction by head movement and embouchere makes me think. To play ro in E on this 1.6 i had to play very kari. I can't do more correction with going in kari position to compensate for the flat tsu. Well, the flute was sold as 1.7 but it measures 1.6. Treating it as an 1.7 while playing makes correction for pitch possible. Thanks. it some sort of clear lacquer. it is not an aestetic problem its more the feeling (adhesive). so i will scratch along with my nails. The fact that its length is 1.6 does not always mean it plays in the pitch of 1.6... or what is said to be the pitch of 1.6. Especially not when it is a jinashi. My flute in D I call 1.8 but it measures 1.7 an a bit. My A flute is 2.3 and so forth. Very often jinashi can have a wider bore than jinuri and therefore plays lower in pitch. But nothing is cut in stone... you can have a very narrow bored jinashi as well. On one recording it is written that Watazumi plays a 2.8 and it has the same pitch as my 2.3...??? So if it helps to play as a 1.7 I think that is perhaps that is a good solution... and it probably is not the flute for playing Haru no umi anyway. Yes indeed it does sound like an interesting experiment. It would be really nice if you continue to work with the flute to know how the whole project develops. Perhaps some of the notes will come easier without kari'ing up as much as in the beginning etc.... just a hint! Try rubbing with medium grade steel wool and work your way down to fine. Change grades so as not to scratch the bamboo.. I use #0000 for polishing.
. Have you looked into the bore. There may be dust and old insect parts. Is this flute worth any effort? Yes, especially if you are like me and love working on flutes! Hi, hi, hi, i can hear the teachers choir in the background whispering and humming: "It's not the flute". It was my first try with this flute and i will sure doing better when my embouchere is getting used to it. Didn't know that. Here are some pics. Can provide more if more details are required. Here you can see that the inside lacquer is partly gone. Should the bore be relacquered? Looks like the utaguchi may have been replaced, which is why it's a Tozan rather than Myoan utaguchi. Looks like a Myoan flute. Don't expect this flute to miraculously turn into a state of the art instrument attuned to Western pitch. Use it for primitive playing. Might have a nice tone, can't tell from a picture! Hi Low Blow, the utaguchi is a filled resin. Probably epoxy of some sort. That shouldn't be an issue, though I would probably take the utaguchi face down a bit more(that means to uniformly remove a small amount of face material with either a fine flat file or fine sand paper on a flat block) until the top edge of the insert portion is relatively continuous and at the same level on both sides (the small lip on the upper right edge needs to be taken down.) I would also make sure that the bore side of the insert portion is smooth without any big gaps or ledges. These will definitely disturb the airflow. It seems that the binding was put on the prevent further spread of the crack on the back right of the blowing end. As Perry says, it's certainly okay to remove the binding, but I would also suggest that you consider doing something more to prevent that crack from spreading. Maybe more aesthetically pleasing binding or a staple or pin.